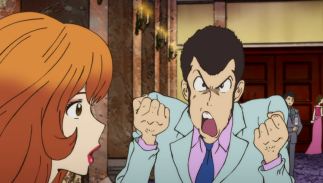 Synopsis: Lupin tries to cut his love in two when he promises both Rebecca and Fujiko to take them as a date to a private party to auction off a dead count's wine collection. He attempts to split his affections and time between the two women, hoping neither of them notice the other or his swift switching between them. 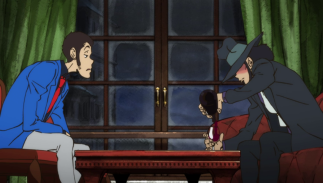 Both women, however, are after the same thing: a special wine said to make people fall in love, Rebecca for the thrill of the steal and Fujiko for profit. But when the whole crowd is lovestruck, will this potion prove poisonous or will Lupin have his best treasure yet, the hearts of two beautiful women? This Lupin adventure will have you exclaiming, "In vino veritas!" 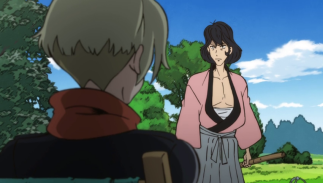 Synopsis: Several assassins are themselves being killed off and Goemon is one of their targets! 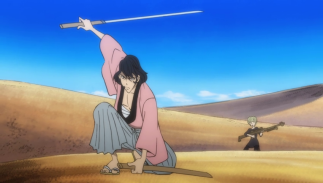 Goemon approaches a fellow killer, a woman named Beladonna from the same hit squad he was in to assassinate an African warlord. Can their old target's bodyguard, a man who shoots a Winchester M70, still be alive, looking for revenge? It's a tale of death, promises, and betrayal, and no matter how you slice it, Goemon will cut to the heart of the matter with his Zentetsuken! 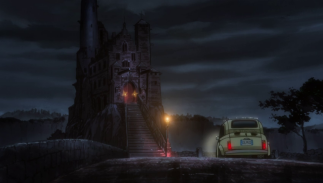 "Welcome to the Haunted Hotel"
Synopsis: After robbing a jewelry store, Lupin and Jigen are forced to steal a car that happens to belong to a pair of kidnappers for the white slave trade. Coincidences continue when the girl in the trunk is both Rebecca Rossellini number one fan and the daughter of MI6 agent Nyx! 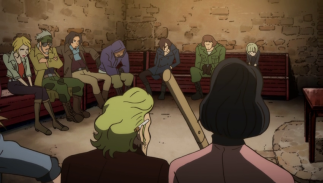 Unfortunately for our favorite thieves, when Nyx tracks his daughter down, he assumes that Lupin and Jigen kidnapped her and Rebecca's in on it. Can the gang stop Nyx's rampage in his retrieval of his daughter? The agent with a license to kill has Lupin in his sight again! 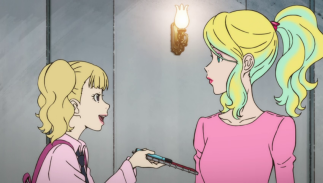 Episode 05, "The Magician's Left Hand"
Synopsis: Lupin investigates Fujiko's relationship with a young magician from a circus, Luca, who seems to have had fallen in love with her. 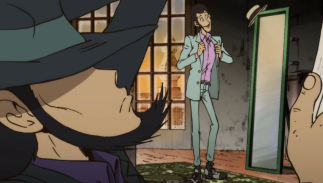 Lupin is incredulous, as Fujiko's motivations always involve a swindle, and becoming a knife-throwing act seems like a cover. 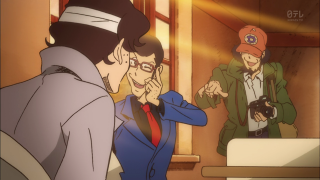 Sure enough, it seems like Fujiko is after the Trick Recipes, the codex of circus tricks and secrets, that could be valuable, and which only exists in Luca's mind. 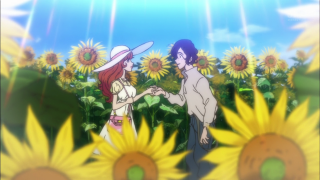 What is Fujiko's motivations for supporting the reserved young man whose burning desire is to become a great magician? 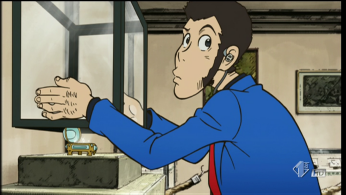 It's all about slight of hand as Lupin tries to decipher the clues to this magical mystery! 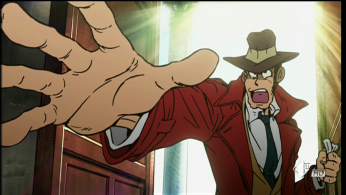 Join me as I look at a gravity-defying, science-breaking classic Lupin III Wolf adventure! Bye Bye, Lady Liberty is available from Discotek. Episode 03, ".02 Chance of Survival"
Synopsis: Lupin III is in the cross hairs of MI6! The famous thief has set his eyes on the fragment of a diamond necklace made for Marie Antoinette that was hidden in the San Leo prison by Alessandra Cagliostro. But during the visit of a royal visit from the Prince of England to view the treasure, the British Secret Service is eager to remove Lupin from the equation, by any means necessary. 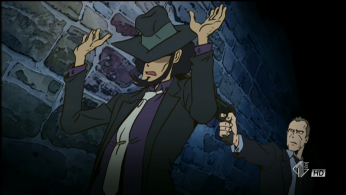 So Nix, a determined agent with a license to kill, captures Jigen to lure Lupin. Can our felonious friend Lupin outsmart and outmaneuver an ace on Her Majesty's Secret Service? Lupin prefers his heists shaken, not stirred! 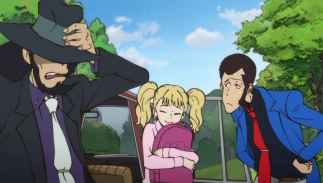 Episode 01, "The Marriage of Lupin III"
Synopsis: It's wedding bells for master thief Lupin III in the Italian republic of San Marino! Tying the knot with a CEO and celebutante Rebecca Rossellini. But despite all the happy tidings, it's obvious that Lupin is up to something. 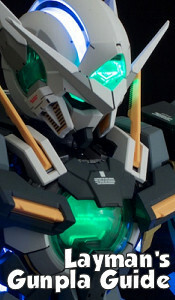 In this case, he has his eyes on San Marino's national treasure, the Royal Crown of Liberty. It proves impossible to keep the crafty Fujiko in the dark about this, though, and she's not the only lady looking to make herself a queen! 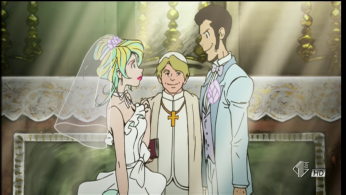 Can Lupin the Newlywed keep himself from being caught? 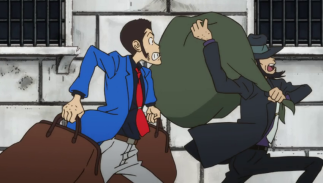 The brand new Lupin TV show is molto bene!